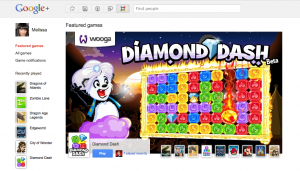 Google announced Thursday that it has started rolling out games on Google+; including Angry Birds, Bejeweled Blitz and Zynga Poker. Google is clearly aiming to take their newest effort in the social networking space into Facebook’s territory. With today’s announcement, they’re officially one step closer. Games are a huge draw on Facebook, keeping a high level of user engagement (and time spent on) the site. It makes sense for Google to incorporate them into its service… we knew it was coming. When you’re ready to play, the Games page is waiting—click the games button at the top of your stream. You can see the latest game updates from your circles, browse the invites you’ve received and check out games that people you know have played recently. The Games page is also where your game accomplishments will appear. So you can comfortably share your latest high score—your circles will only see the updates when they’re interested in playing games too. If you’re not interested in games, it’s easy to ignore them. Your stream will remain focused on conversations with the people you care about. Google is also looking to rapidly expand their games selection by calling out to developers to jump on the bandwagon. If you don’t see Google+ Games on your home screen yet (I don’t), don’t worry. Google says the rollout will be gradual. I’ve heard that if you don’t have it now that it should show up in the next few days. The games will be accessible via a “games” option at the top of your Google+ stream. When you go there, “you can see the latest game updates from your circles, browse the invites you’ve received and check out games that people you know have played recently,” as well as see your own accomplishments (wow… so it’ll have achievements too!). If you want to share your high scores on your Google+ stream, only friends who are players will see the updates. As pointed out on Plusheadlines, “Facebook currently takes a large 30% share of all in game purchases from developers. Although this is still an incredibly profitable business model for many of the larger developers like Zynga, it can leave the smaller game developers out in the cold. Google+ on the other hand will only take a 5% cut of all in game purchases.” The bottom line, expect developers to flock to Google+. Games, however, are only the tip of the iceberg. Google also announced that it has launched yet another company blog for developers who want to create Web apps for Google+. And those apps don’t have to be games. The games API is just the first of many that are in store for Google+.